Doesn't have the option of a floating window that features in programs such as CDBurnerXP. BurnAware Free is probably the prettiest in the interface department for this collection and offers a step-by-step procedure for your burning projects. It is now probably one of the most popular free CD, DVD, Blu-ray Disc burning software available for Windows. Using BurnAware Free Edition you can easily create and burn Audio and MP3 CD, Data and DVD-Video disc, ISO and Cue Image, erase or format rewritable disc, copy your CD or DVD to ISO image. This software is for personal home use only. A launch window lets you choose the type of project you want and leads you through the process to completion. Navigating your directories is easy with BurnAware's file management system and adding files is as simple as highlighting them and hitting a button. BurnAware offers enough features for most burning projects including burn data, bootable and multi-session discs, burn audio, video and MP3 discs, create and burn ISO/CUE/BIN images, copy discs to ISO images and erase rewritable discs. Sometimes you just need a simple program for your burning needs and don't need all the extra features of a paid application. Windows NT/2000/XP/Vista/7 (32 and 64 Bit), .Net framework is NOT required. If the free version copied audio CDs at one time, it doesn't now. You can rip or make ISOs (which eventually would allow you to make a copy) but a straight 1-1 copy option isn't there. VirusTotal showed it safe when I checked it 2/5/17 :-). Web Of Trust gave it Trustworthiness 91. Be sure to uncheck extra items offered if you don't want them. It offered me Ad-Aware Web Companion and offered to change homepage to Yahoo. Installed Chromium and an 'Anti-Malware' suite without asking. No longer using. 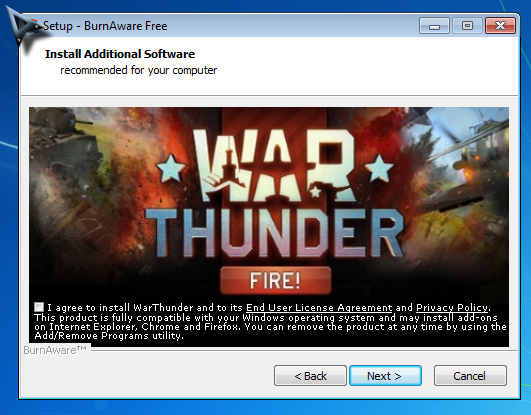 Because so many freeware apps now include additional components it is important to pay attention both before downloading and when installing. There are two freeware versions available as listed on their website, "free" (7.6MB) and "cfree" (6.8MB) which contains no additional offers. Even if you download the wrong version by mistake, it does ask if you wish to install the additional items which will vary depending on what is seen when your computer is scanned. These are the windows that were presented to me just now. We have also published an information page to guide you through this process. MC - Site Manager. If you go to the bottom of the BurnAware download page, there is a link to the "Free Version" without any optional offers. This scans clean at Virus Total (0 of 66).